By now you can tell that I'm doing a little series on our walk down to the river last Friday morning. You can also tell that I've been removing the color from some of the photos. Taking pictures in the fog is challenging. There's not much color to begin with, and I seem to get colors in the photo that I didn't originally see. Mist on the Cher River shows up better in black and white, at least in this picture. For example, the fog tends to come out looking purple in my pictures. I use Photoshop to crop and straighten up a lot of my images and I'm learning how to use other post-processing tools to make the final shot look more or less how I saw it in the first place. Or even how I wish I had seen it. As for removing the color altogether, some photos are just more dramatic in black and white. I can see things that I might not have noticed in color. Not all images lend themselves to b/w, however. Contrast is the key to a good b/w photo, I think. And I know there is a talent to taking original photos in black and white versus creating a b/w image from a color one in post-processing. I don't have much experience with the former, and I'm far from an expert in the latter. Do any of you photographers out there dabble in b/w? I'd love to hear what you think. ...when we come to it. And so we did. The dirt road to the river crosses over this bridge, which is little more than a culvert with a low stone wall on either side. The stream that it crosses is called La Rouère de l'Aulne (The Alder Stream); it runs down through the woods just to the south of our house to join the river. The thickening fog made it difficult to see more than a hundred meters or so. Near this point there are several paths that branch off through the woods. They're more than paths, really, but less than roads. It's obvious from the tire tracks that vehicles go through often. I suspect there are some hunters in their vans, some farmers on their tractors, and some kids in cars who frequent these woods. There were a few empty beer and wine bottles strewn about. But on this morning we were quite alone. Callie may look like she's a bit nervous about heading into the woods and toward the river, but in reality she's very excited. She likes to explore, especially when there are new places to sniff around in. There are often deer grazing in this field and I just knew she could smell them. 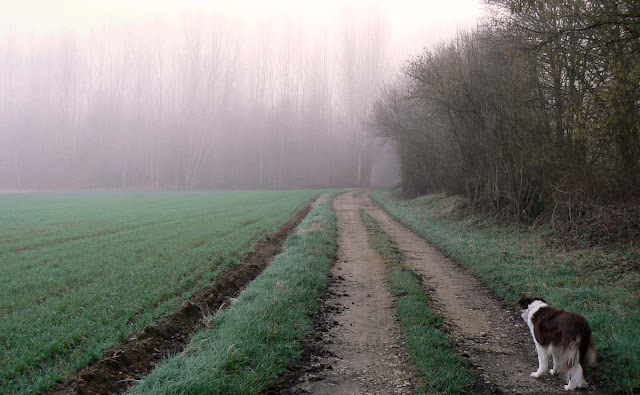 The fog got thicker as we headed into the woods toward the river. We actually did see a deer on our way back out and Callie had a good romp chasing after it. She never goes very far and always comes back happy. After all, chasing animals is what she was bred to do. But in her case the wildlife has the advantage. Border collies like to chase in short circles; the long run is not at all interesting to them. Callie and I took our morning walk down by the river on Friday. We normally don't go that way because it involves walking down our road and then crossing the main road between Mareuil-sur-Cher and Saint-Aignan. The cars and trucks roll quite fast along that stretch and I worry about Callie. But on Friday we gave it shot. She did very well and we made it without incident. One tree or three? On the left bank of the foggy Cher River. Once we crossed the big road, we headed down a dirt path to the water. 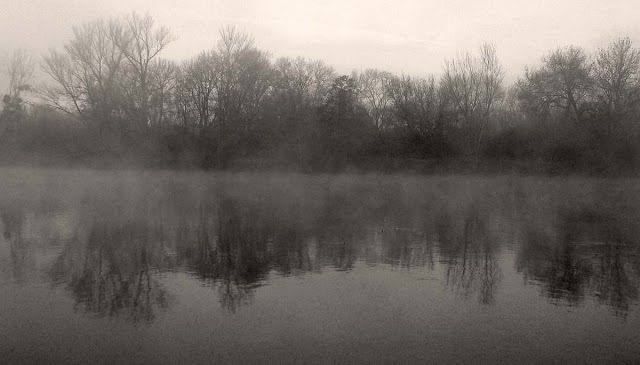 The sun was just coming up and fog was forming over the river. The woods were silent and a bit eerie, but very pretty. The ground was muddier than we're used to as the river had risen over its banks a couple of weeks ago. It has since receded into its bed. Callie discovered a few ducks hanging out on the riverbank and got all excited when they took off across the water. For a moment I was afraid she'd dive in after them, but she's not a water dog and I didn't have to worry. 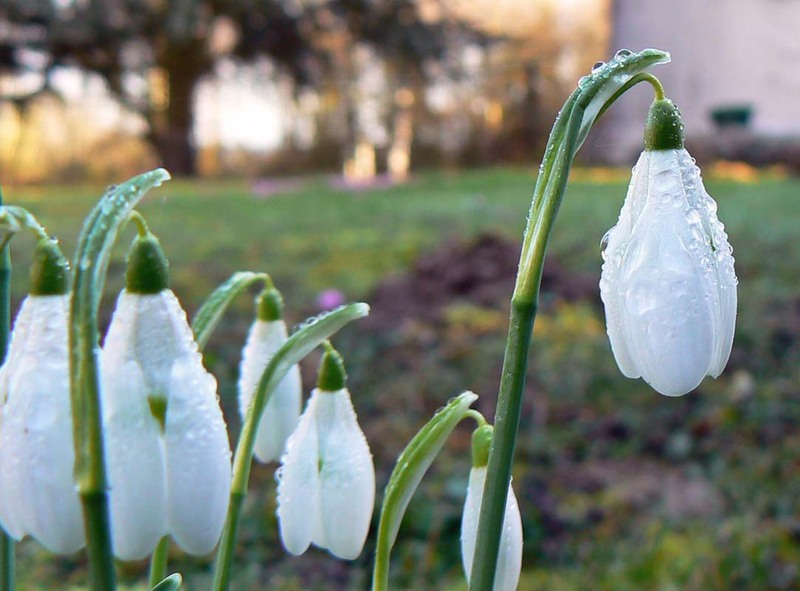 The perce-neige (snowdrops) are up and, compared to last year, they seem to be several weeks early. The good news is that this particular bunch came back after being uprooted last winter by the moles. I had just planted them after swiping them from the woods on our neighbors' property (shhhh, don't tell) and the moles raised a hill right where I put them. Snowdrops after an overnight rain shower. They still sprouted and grew and over time I gently nudged them back underground. And here they are this year blooming! Interestingly, none of the other patches I planted seem to be up yet. I'm hoping they will come up before long. If not, I may make another scavenging run in the woods for more bulbs. I could always buy some, but there's no fun in that. The moles are very active in our back yard this year. I swear I'm going to name the little mountain range out there. It's probably visible from space. A few years ago I tried, in vain, to get rid of the little varmints (you can read about it here if you're interested). But I've since made my peace with the moles. They're good for the soil (if not for the grass) and they eat grubs and other larvae. The Great Southwestern Mole Range in part of the back yard. A good source of potting soil. Oddly enough, I thought that Bertie would help us to reduce the mole population or, at the very least, scare the little devils away. But no. In the nearly two years that Bert has been with us, he's brought us exactly two moles. And he didn't eat either of them. Last week, during Bert's annual visit to the vet, we learned that cats aren't generally interested in moles. The vet didn't really explain why, and the little internet research I did wasn't particularly illuminating. But the evidence is clear: Bertie's presence has not had an impact on our mole population. It could be because Bert doesn't spend a lot of time in the back yard. I think he sees the yard as the dog's domain. Callie will chase him out or up a tree if she sees him out there. Bert's wanderings generally take him farther afield. Maybe all the moles in our neighborhood see our yard as a safe haven. Our football evening with friends was much fun. The game was good, and it even went into overtime. The better team won. The food was good, too. 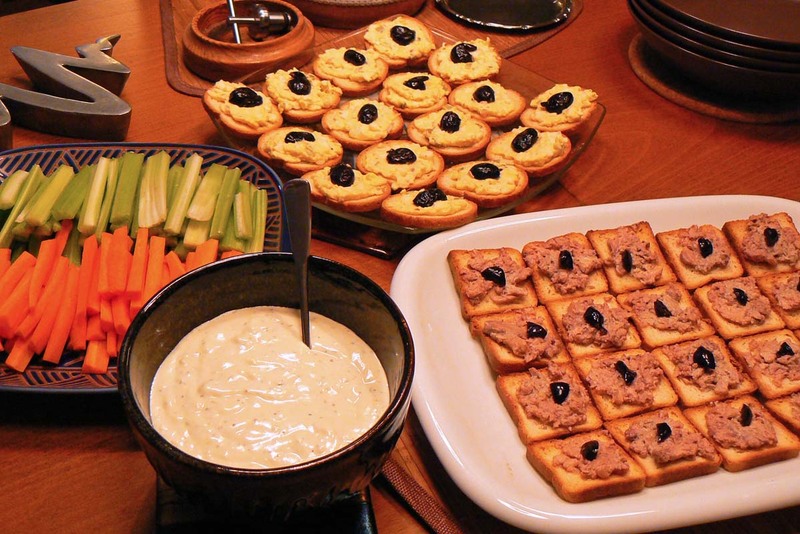 We tried to make everything more or less "finger food." Some of the party food. The black bits are black olives. In addition to the savory muffins I showed you yesterday, we had egg salad on toast rounds and foie de morue (cod liver) on toast squares. The main course was strips of chicken breast prepared Buffalo wings style with celery and carrot strips and a blue-cheese dressing dip. The original plan was to make deviled eggs, but the darned eggs didn't peel well. What a mess. So they got turned into egg salad. We opened a bottle of Montaudan champagne to start, then moved to a red Bourgueil (cabernet franc) and a white Saumur (chenin blanc). Our friends brought an apple pie with a walnut crumble topping which we served for dessert. Very rich and very tasty! I'm giving my mini-muffin molds a run for their money. And since they didn't cost very much to begin with, I think I'm ahead of the game. Speaking of games, I made these little muffins for our American football night on Monday. The original recipe is for a savory cake from the Auvergne region called un pounti. La mise-en-place. All the ingredients assembled for making the cake batter. The cake is made with chopped prunes (I used raisins), smoked ham, raw cured ham, cantal cheese, and blettes (Swiss chard). 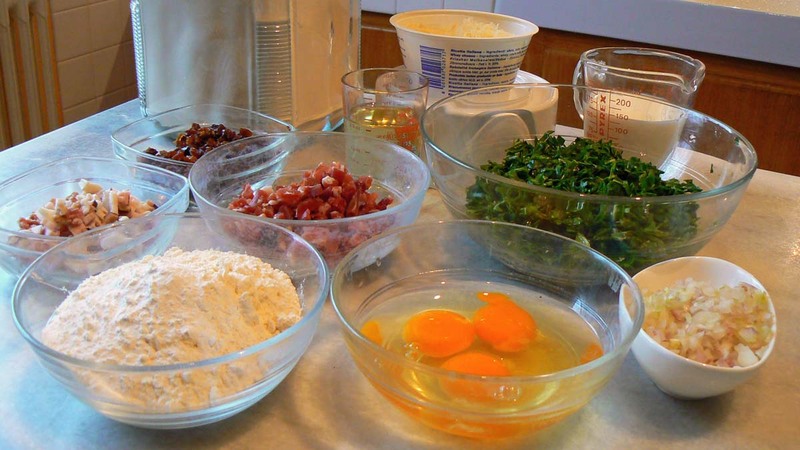 These ingredients go into a batter made with flour, baking powder, eggs, milk, oil, and some onion. I had to adapt the recipe for the mini-muffin format, so I chopped all the ingredients very finely. The muffin batter in the molds. I love the purple color of the molds! I was lucky to have some Swiss chard in the garden. Since our winter has been so mild, last year's chard has continued to grow and there were enough fresh leaves in our January garden for this recipe. It's nice to be using fresh garden produce this time of year. 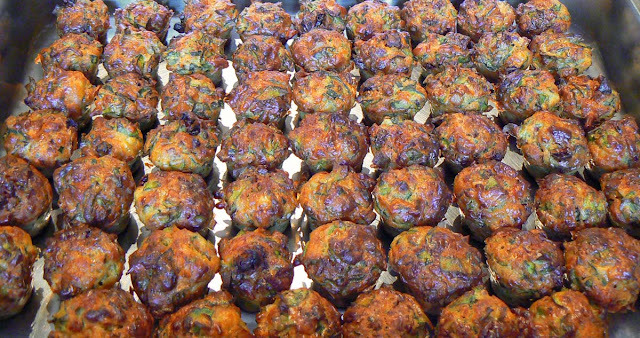 Sixty little savory cakes. Perfect bite-sized morsels for watching football. And just in case you counted, there are only 59 visible because one is outside the photo on the bottom right. I spooned the mixture into the muffin mold and baked it about half the time called for in the recipe for a whole loaf. The muffins cook much quicker than a loaf does. They came out beautifully. The recipe takes a bit of prep work, but if you want bite-sized cakes for a party, it's worth the effort. My recipe made sixty mini-muffins! This is a recipe for chocolate cake, made with grated summer squash (grown in the garden, grated, and frozen), that I used to make mini-muffins (or maybe more accurately, mini-cupcakes). The batter went easily into a poche à douille (pastry bag) which I then used to fill the muffin molds. Chocolate mini-muffins cooling on a rack. I'll serve them sprinkled with powdered sugar as dessert for tonight's finger-food evening of football watching. I thought I'd share the second galette I made for the season. It's probably the last one because, as everybody knows, the beginning of February means crêpes! I did better rolling the dough out evenly this time, and instead of a spiral pattern, I made leaves (I saw someone do that on tv). 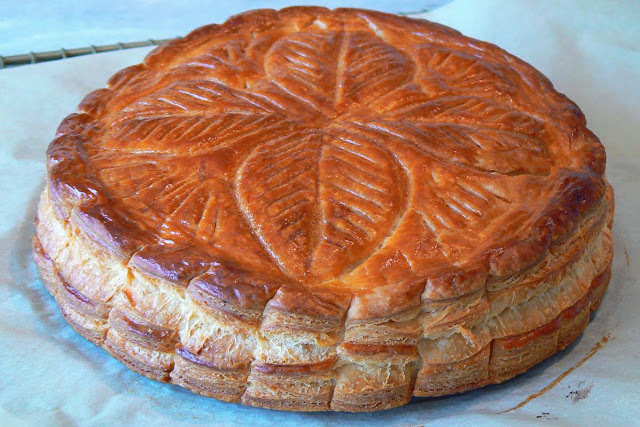 Une galette des rois made with pâte feuilletée (flaky pastry) filled with home-made almond paste. We already got a jump on crêpe season by making some on Friday. Ken got a new crêpe pan (on sale at the supermarket) that's almost twice the diameter of our other one. So we get bigger but fewer crêpes from the recipe we use. That can be good because it doesn't take as long to make a batch. I'm going to make buckwheat crêpes for our lunch on la chandeleur (February 2) this year. We'll probably fill them with ham and cheese. Yum. Again? So soon? Yup. This is one of Callie's favorite routes, a deer path through an empty field between two vineyard parcels. I often won't take her this way when there's tall grass in the summer (lots of ticks) or when there's wet grass in the winter (cold wet jeans are no fun). But sometimes it's ok and we head on through. I can tell when we go that way that she really likes it. You can see how frosty the grass is. This time we saw Bruno L.'s burning barrel. It was early enough that Bruno hadn't arrived yet and there was no fire. Callie had a good sniff around; Bruno's dogs hang out with him when he's pruning and burning and I'm sure Callie could smell them. You have to take 'em when you can get 'em. This time of year we have fog and clouds that conspire to hide the sunrise. So when the sky is clear, like it was on Tuesday, it's a treat. And when there are airline contrails streaking across the eastern sky, the effect can be interesting. Tuesday morning was also quite cold at a few degrees below freezing. I know there are colder places and I'm glad I'm not in them. This is just the right amount of cold for me. Enough to know that it's winter, but not enough to seriously mess with our daily life. Except for one thing: the daily fire. Since we supplement our central heating plant with a wood burning stove, I have the daily chore of cleaning out the stove and building the new fire. I've told you before: it's fun in the fall and early winter. Pretty, nice and cozy, very holiday-like. But by the end of January it starts to get old. Cold ashes to sweep, gather, and dump (and ash dust that covers everything), going out in the cold for kindling and to split a few logs to get the fire going. I really don't mind it at all. The fire is warm and saves us from burning more fuel oil. Our stove is a newer one that burns very efficiently (you can't see any smoke coming from our chimney) and firewood is a renewable energy source (it's a big business with all the big managed forests around here). But I still look forward to March when it can be warm enough to skip the fire, and not long after when I don't have to think about it again for six months. The winter vineyard looks brown and drab, but it is actually alive with color. First, the grass between the rows of vines is deep green. It doesn't get cold enough here to turn the grass brown and it stays green as long as there is rain. There is also a good variety of evergreen plants and trees to balance out the browns and grays of the bare deciduous varieties. An osier on the edge of the vineyard. Here and there you can also see plants with berries, most common among them are the wild roses with their bright red hips. The plant pictured above is an osier, a variety of willow sometimes used in making wicker baskets and other items. Around us, the growers cut and use it to bundle grapevine trimmings for kindling. Osier likes water and grows near ponds or small streams. In the fall the stems turn this bright yellow-orange color. The past few mornings have brought temperatures below freezing and, as I hinted before, the little flowers that were still blooming out in the vineyard are dying back now. They're almost as beautiful in death as they were in life. Not a dandelion but a flower from the same family. This one got frozen just as it was about to open. Susan reminded me (thanks!) that I have a mono-pod (as opposed to a tripod) for the camera, so I took it out with me on Tuesday morning's sunrise walk. It helped me keep steady in the low light and my pictures are better. I'm still having problems with the focus in macro (close up) mode. My camera's manual focus doesn't function all that well. First off, it's electronic and not truly manual and the buttons are a pain to manipulate, especially when I'm wearing gloves in below-freezing temperatures. Second, the range of focus is very limited so I'm often not pleased with the result. This is the same photo, just cropped differently. The other issue is that the automatic focus has a handful of options that go from a wide general focus to a point focus, with several in-between settings. Navigating the menus to change that for each image is hard enough to do without gloves. As a result, I often end up with depth-of-field problems: a photo where the background is crisp and clear and my subject is blurry, or a portion of the subject is in focus while another portion is not. This is one of the reasons I want to upgrade to a reflex camera with lenses I can manipulate manually, like I used to do with my film camera. The wind storm we had in mid-December was not as bad as the one we had in 2010. Still, there are lots of branches down all over, including in our yard, but mostly in the woods around the vineyards. Even some small trees went over, like this one. 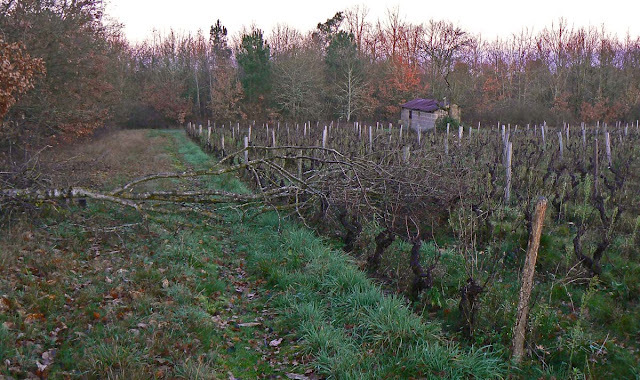 A small tree blew down onto the vines. Someone will be up there soon with a chainsaw. I've been picking up branches in our yard and across the street in our neighbors' yard for a while now. I use what I gather as kindling to start the daily fire in the wood stove. A lot of what I pick up is from the many birch trees around, and that stuff burns hot and quick. I usually have a good collection of the stuff at the start of the season, as I pick it up all during spring and summer, but the stack never lasts me through the whole winter; I'm usually gathering more sticks and twigs in January and February. Sunday morning when I got up from bed I did what I usually do: open the shades on the skylight windows in the loft. To my surprise, the windows were frosted over. Real frozen frost. A look at the thermometer showed the outside temperature to be about minus two celsius. Below freezing. This wild carrot bud will not likely open up now that it's been frozen (it wasn't yet frozen when I took the picture). Callie and I went out for our walk at sunrise and it was nice. Clear sky, no wind, and cold. The puddles were frozen over, the grass was frosty, and Callie stayed clean. I love it when I don't have to wash her off after a walk. That happens in winter, and only if everything is frozen, and in summer, only if everything is bone dry. 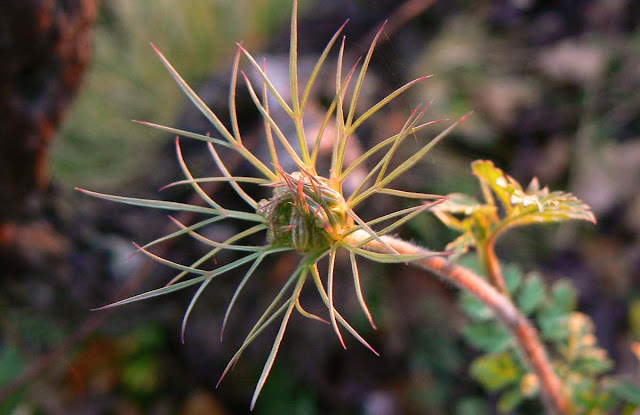 The morning freezes are expected to continue for a few days, so the summer plants, like the wild carrot above, will likely die back. And, we hope, the bug population will be reduced. Callie loves her daily walks in the vineyard. This is her fifth winter of vineyard walks, so she knows the routine. She even knows most of the people who work pruning the vines this time of year, although she doesn't treat them all equally. Callie stops to see which way I'm going to go, left or right (I went left). For example, the guy who's working in this photo (you can see where he is by the column of smoke rising as he burns the clippings) is someone she knows and likes. His name is Bruno and he has three dogs that are often with him out in the vines. Callie will run up to Bruno and let him pet and hug her. There are other people who work out there that she'll run up to to say hello, but for some reason she won't let them touch her. I'm not sure how she decides who to get close to and who to stay clear of. These particular people like dogs and don't do anything that I recognize as threatening. It might be that there are three of them, or it might be the orange battery packs they wear to power their pruning shears. Or maybe they smell funny. Who knows? 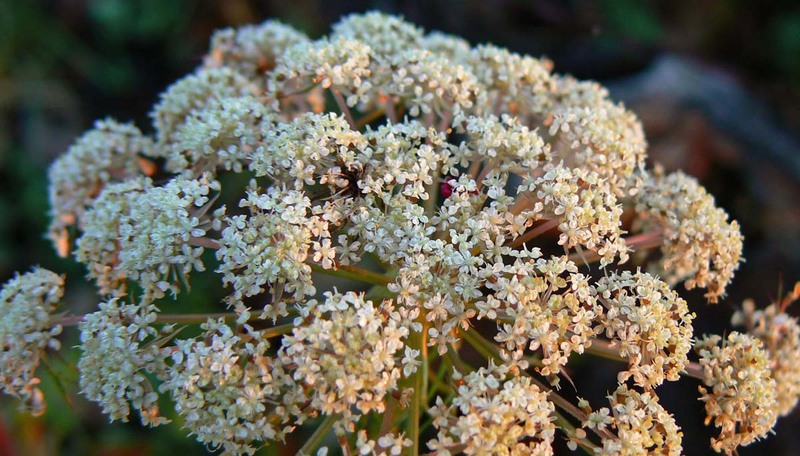 La carotte sauvage (wild carrot or Queen Anne's lace) is a late summer and fall bloomer. Here it is mid-January and the plants are still producing flowers. 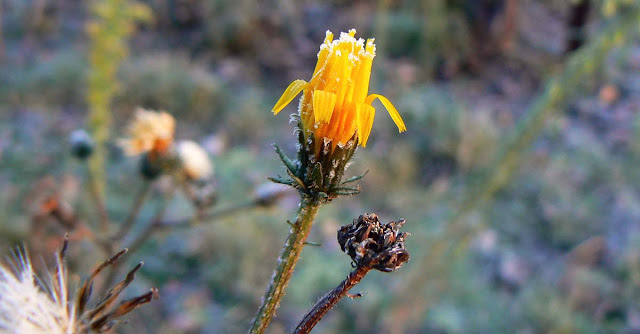 Normally, by this time of year, freezes have stopped all of that and the flower stalks are dry and brown. A wild carrot in bloom, in January, in the vineyards behind our house. This condition mightn't last, however, as we are expecting our first freezes of the season this weekend. The weather people are not predicting hard freezes; the mornings will be at or just below the freezing point. 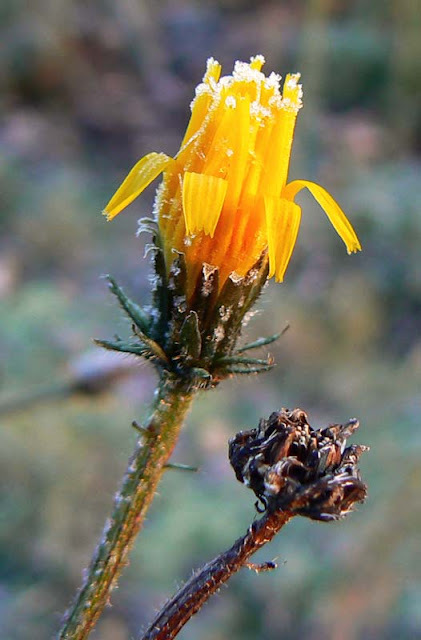 It may not be enough yet to stop the flowering or kill that bugs that are normally gone by now. We'll see. The full moon occurred on Monday, but with our foggy days and nights we don't get to see much of it. After dark the sky is luminescent, the fog kind of glows in the sky. That's how I know the moon is really there. On Wednesday morning the fog was gone and there was the moon, a couple of days past full, sinking down in the western sky over the vineyards. The sun had actually just made it up when I took this picture toward the end of my walk. I was outside before the sun came up, so my pictures from this walk came out a bit fuzzy. I didn't take the tripod with me. I still got a few interesting shots, but was disappointed with most of them. Lugging the tripod around on a dog walk is not all that much fun, but the photos come out better. 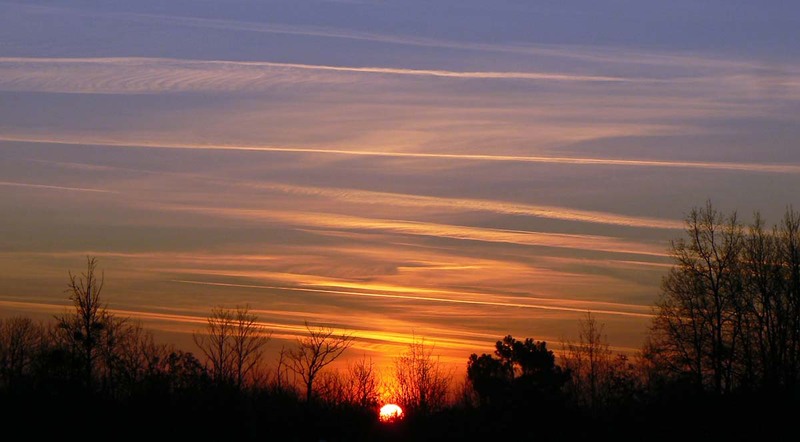 Even with the lengthening days, we still have fewer than eight hours of light between sunrise and sunset. 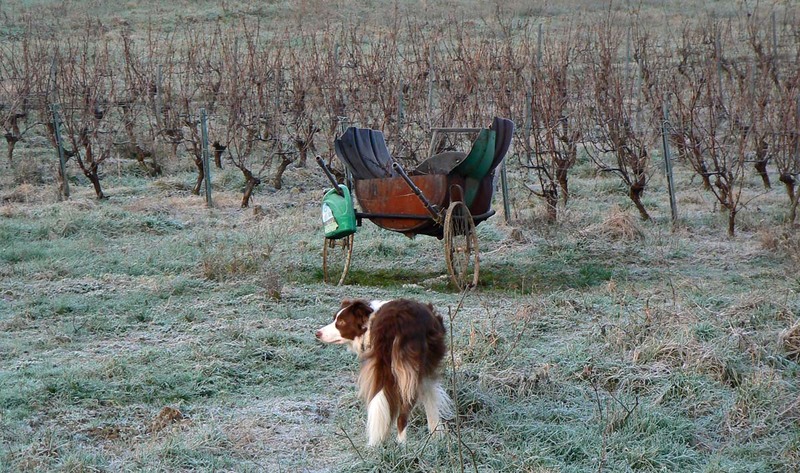 The grape growers have to get up and out before the crack of dawn to get in a full day's work. Remember, between noon and two p.m. they stop and go home for lunch. That makes for about six good hours of pruning. A grower pruning grape vines at sunrise on Wednesday. 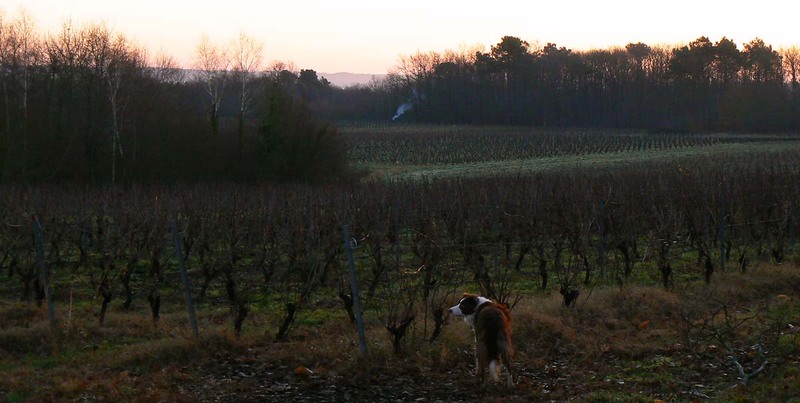 Many of the growers around us are out before the sun comes up and don't leave until well after it has set, making for a decent eight hours in the vines. We see them on our daily walks with the dog, which happen at sunrise and sunset every day. The guy in this photo works alone or with one other colleague on this parcel out by the end of our dirt road. He uses pruning shears powered by a battery pack (most of them do) and lines up the cuttings in neat rows in the space between the vines. Later in the spring he'll drive his tractor up and down the rows pulling a mulcher to grind up the cuttings. By the way, this is this blog's 2,000th post! 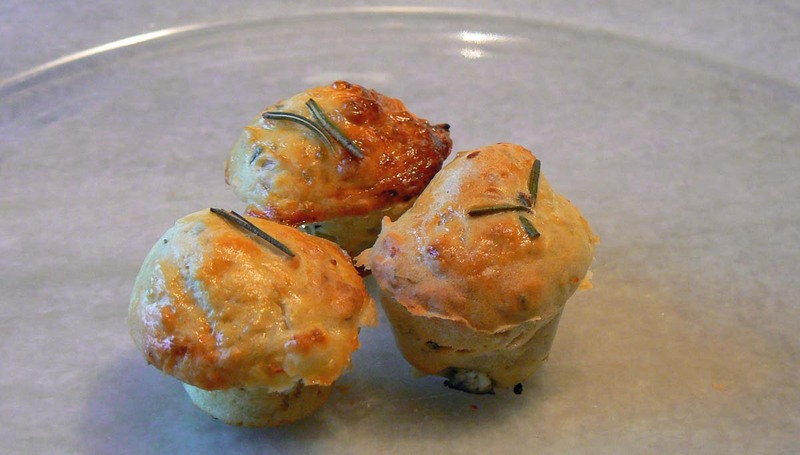 About a month ago, I saw this recipe for savory mini-muffins on Chez Loulou, a blog written by a fellow American expatriate who, until her recent move to Normandy, lived in the south of France. Loulou's stated goal is to taste "each and every French cheese available in France." She started on that quest in 2007 and I believe she is getting very close to achieving it. 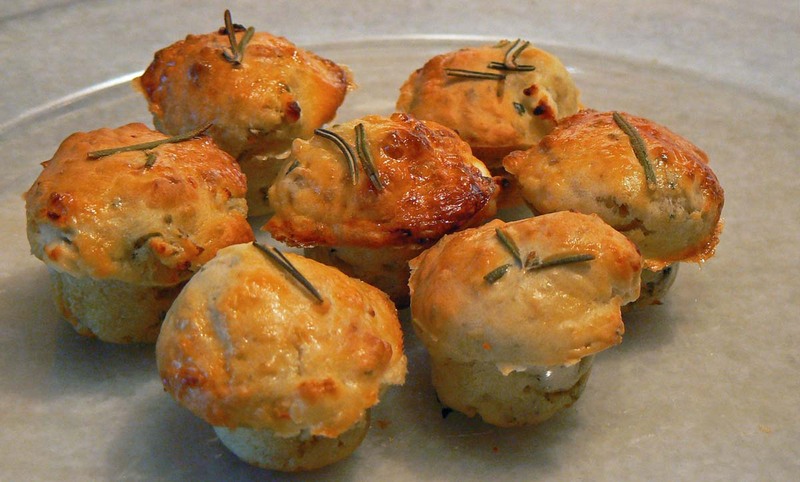 Mini-muffins made with goat cheese and rosemary. I liked the idea of these muffins that I could serve at apéro time and I wanted to try them, especially because we live at the intersection of three A.O.C. goat cheese producing regions. I got a set of mini-muffin pans last week (a steal from Auchan: a silicon mold for fifteen muffins for three euros. I got two!) and made the recipe over the weekend. As Loulou points out, the recipe is easy, not fussy. And the bite-sized muffins are perfect finger food. My muffins didn't turn out as well-formed as Loulou's, but they were amazingly tasty and I know they will be a hit whenever we host drinks and snacks. I'll work on improving their looks the next time I make them. I also got to thinking about variations on the theme. 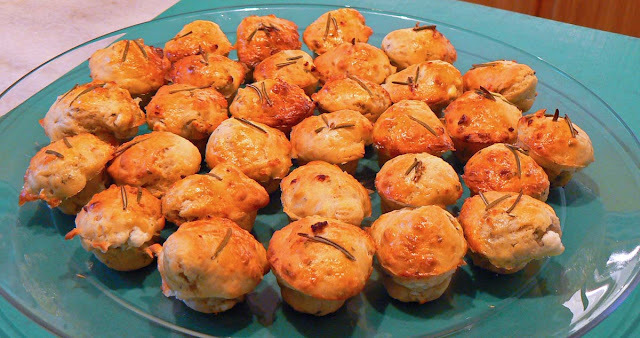 I'm sure this technique would work well with other savory breads like pounti, not to mention sweet ones like zucchini or pumpkin breads. ...or a tray-full for a crowd. It should come as no surprise that some people cook for their dogs. 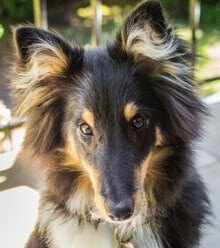 Some dogs are picky eaters, others have bad reactions to commercial pet foods, and some are just pampered pooches. Callie is in the unenviable position of living with thrifty humans. I can't see paying the prices for canned or pouched wet food for her. Her main staple is store-bought dry kibble, but that can get boring. All this dog food for €1.50! So whenever we have table scraps of meat, cartilage, fat, or cheese rinds, they go into the fridge for Callie. I add a little of the tasty stuff to her kibble and that gets her appetite going. We actually used to cook rice for her, but she started gaining weight, so we cut that out. I don't think she misses it. 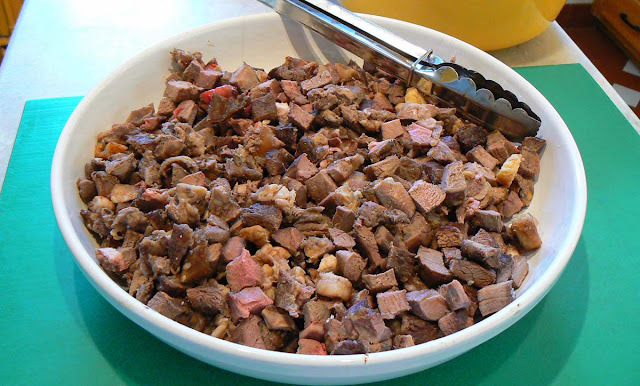 Here's the cooked and cubed meat, ready for the freezer. Just the other day, when I went to feed Callie, I noticed that we were out of meat scraps. No cheese rinds, either. Nothing. I was heading out to the grocery store and Ken suggested I look for viande pour animaux (meat for animals) at the butcher section. Our local Super U grocery frequently has bits of meat they sell for pets, but the cost is not much lower than standard stew beef, so we don't make a habit of buying it. But on Saturday I checked at our other local market, Intermarché, and they had a big package of viande pour animaux. It must have weighed about a kilo and a half (about three and a third pounds) and they were selling it for €1.50 (about $1.90 US). That works out to about one euro a kilo or 58¢ a pound. And it looked pretty good. I mean, there were whole steaks in there! Normally our supermarkets will mark down meat items on their sell-by dates. I assume that if they don't sell by then, they will then get repackaged for animals. These cuts, as you can see above, are not at all attractive for human consumption, but Callie isn't as discriminating when it comes to meat. 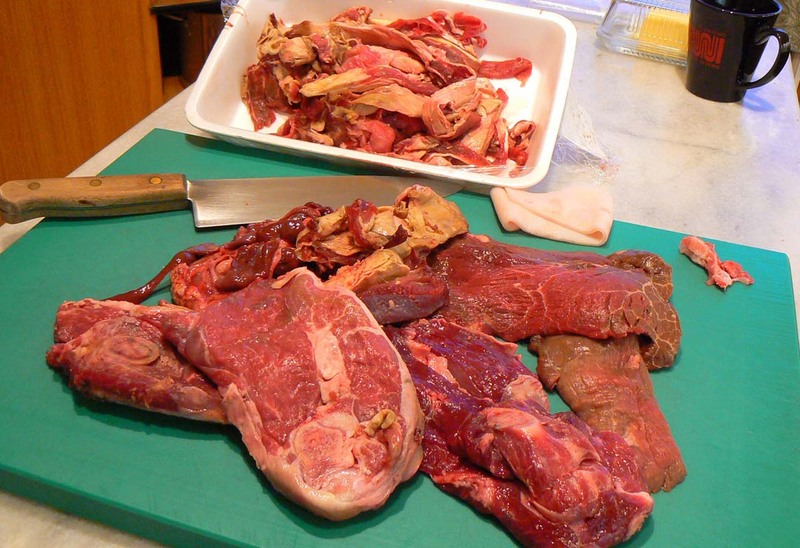 As I said, the package had several whole steaks, some organs (mostly liver), and long strips of trimmed fat and meat. I cooked it all in the oven then cut it up into chunks. I ended up with four ziploc bags full for the freezer and one container for the fridge. The cooked meat weighed in at about 1.2 kilos (2.6 lbs.). That should keep Callie happy for a while. The Spo-shirt arrives in France! A little background: Ur-Spo is a blogger who lives in Phoenix, Arizona (USA). He writes Spo-Reflections, a blog I've been reading for some years now. He's a psychiatrist. A Jungian, I believe, although I have really no idea what that means. He's originally from Michigan and from a big family. He likes good tea (no rubbish), and enjoys a "jolly good time." He lives with Someone (his partner) and their dog Harper. He spends annual vacations in Palm Springs and Key West. And he makes shirts. Yours truly posing at Chambord sporting the famous Spo Shirt of Shirts. Dr. Spo (pour les intimes) likes to sew shirts using unusual tropical-style fabrics. He has made many, both for himself and for his friends. When he blogs about new shirts or new fabrics, his followers (which he lovingly calls Spo-Fans or Friends of Spo) love them. One of the Spo-Fans loved the shirts so much, he suggested that Dr. Spo send one of his shirts on an around-the-world tour. And so he did. Read about it here. All this could be yours. If you're a French king from the 16th century. Dr. Spo decided that for every person that wore the shirt and blogged about it, he would donate a certain sum to one of four charities, thus making the Spo Shirt Tour a worthy cause. The charities from which he will choose are: Doctors Without Borders (Médecins sans frontières), the Humane Society, Test Positive Awareness, and the Prostate Cancer Foundation. All worthy, although as a dog lover, I'm partial to the Humane Society. I got the shirt from Peter in the Netherlands last November. 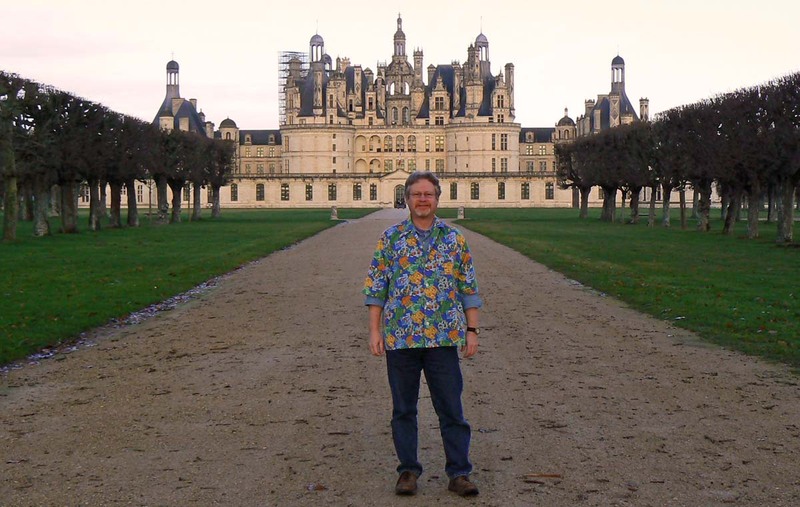 Since then, I've been waiting for a good weather day to make photos of me wearing it at the Château de Chambord, a local historical site and one of the most famous of French castles. We had the holidays, we had the storms, and we had the colds that knocked us out. 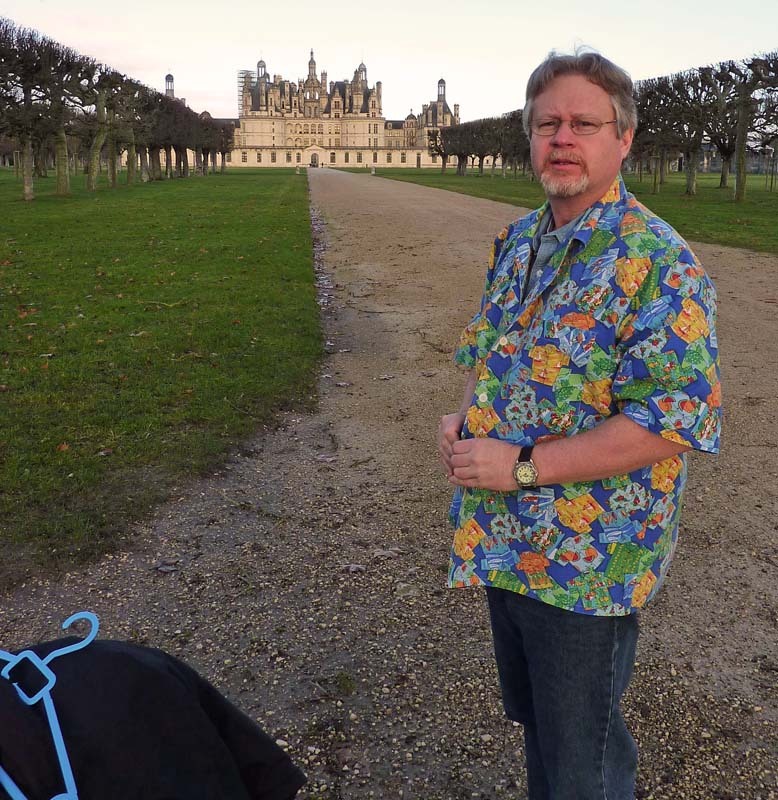 But last Friday, everything came together and Ken and I drove up to Chambord for a photo session. "Le Making Of" as they say in France. Ken snapped a picture of me prepping for my shoot. It was damn cold. I'm happy to have been able to participate in the Shirt of Shirts World Tour. When it was first announced, I hesitated because I didn't know if anyone would want to send the shirt to Europe. But when I found out that someone indeed did, I signed on. So now I'm sending the shirt on to the United Kingdom. I don't know where it will go from there, but I have heard some rumblings that people in Australia are interested. Wow. I've had four banners on the blog since I started back in 2005. I thought that, since I just changed the banner photo again, I'd do a little retrospective for those of you who may not remember all of them. The first banner was a photo I took long ago of the Paris skyline. My first banner: Paris. I took this shot from the Eiffel Tower many years ago. However, I don't live in Paris. I'm three hours south by car. So, when it came time to change the banner, I looked for something more local. One of the most famous of the Loire Valley castles is Chenonceau, so I used one of my photos of the château's gallery spanning the Cher River to make the new banner. The Cher is the river that flows down at the bottom of our road. This castle is a thirty minute drive from our house. The castle at Chenonceau, my second banner photo. I really liked this one. The next banner is also a local château, but this one is on the Loire River and it's about thirty-five minutes by car from the house. 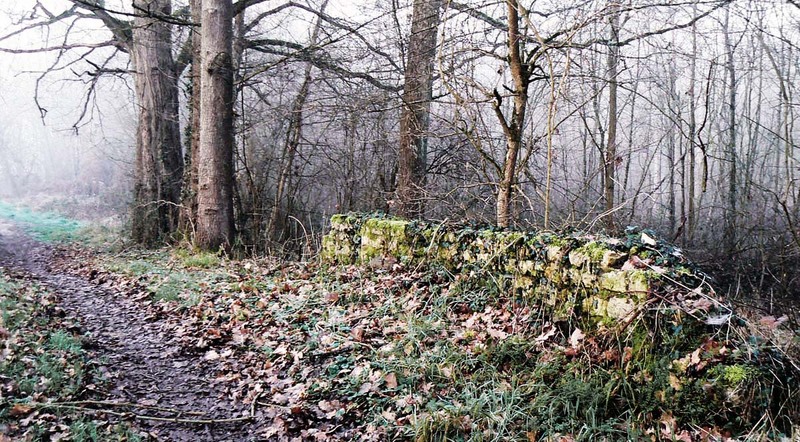 It's called Chaumont and is a wonderful place to visit. I took the photo from the gardens that you used to be able to wander free of charge. Since a couple of years now you have to pay for this view. The third banner shot: Chaumont. I liked this one a lot, too. The current banner photo (at the top of the blog) is the grand-daddy of all the Loire Valley castles: Chambord. * This one's a short forty minute drive from our house. It's a must-see on any visitor's list, although the interior is less impressive than the exterior (in my humble opinion). I took this picture just last Friday while I was modeling for tomorrow's post. *NOTE: since this post was written, the banner has changed again. Twice. 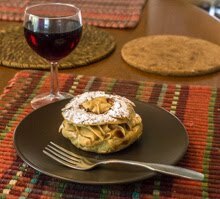 I made the puff pastry on Thursday and it stayed in the refrigerator over night. You don't have to do that, but that's the way it worked out for me this time. When you're ready to make the cake, all you have to do is to roll out the dough so that you can cut two identical circles from it. Roll out the dough to about an eighth of an inch thick, but large enough for two circles. You need to be careful to keep the dough flat. Remember, it's pâte feuilletée (puff pastry). If you ball it up it won't puff up the way it should. So keep it flat. 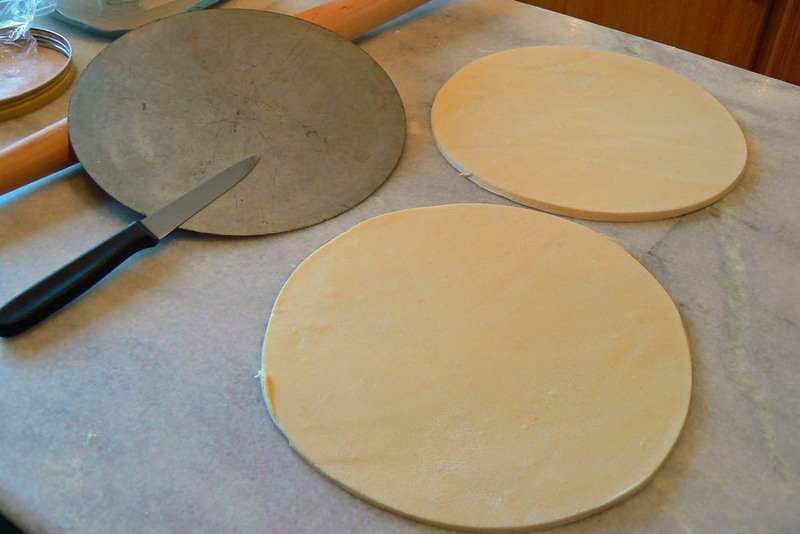 Once it's rolled out, cut two identical circles using a plate or other guide and a sharp knife. Fold up what's left and put it in plastic wrap for later; you can freeze it with no problem. Cut out two identical circles. You can use a plate or a tarte pan bottom, like I did here. Now it's time to fill the pastry. I used store-bought frangipane because the store was out of the ingredient I needed to make my own. That's why it's green (yuck). Normally I mix almond flour, sugar, and eggs to make the filling. That's much better. You can also fill the cake with applesauce or any fruit compote if you like. You also need to add the fève (the prize). This one is a little plate we got in a galette from a local bakery years ago. Yes, I save them. Fill the bottom layer and don't forget the prize! Use a little egg wash around the outside to be sure the top layer will stick, then put the top layer on. With a sharp knife, make a nice decoration on top and nick the edges as you see here. Once that's done and the oven is hot, use the remaining egg wash to cover the top of the cake. Be sure not to let the egg drip onto the edges of the cake because that could keep it from rising as it should. Make some nice designs on top with a knife. This is an easy one, but they can be anything you like. I baked this one in a hot oven for 30 minutes, turning the heat down to moderate about half-way through. The cake is a little lopsided because I didn't roll my dough completely flat. But who cares? It's still beautiful and it tasted great! The finished cake! Let it cool then cut into it. Who will get the prize? 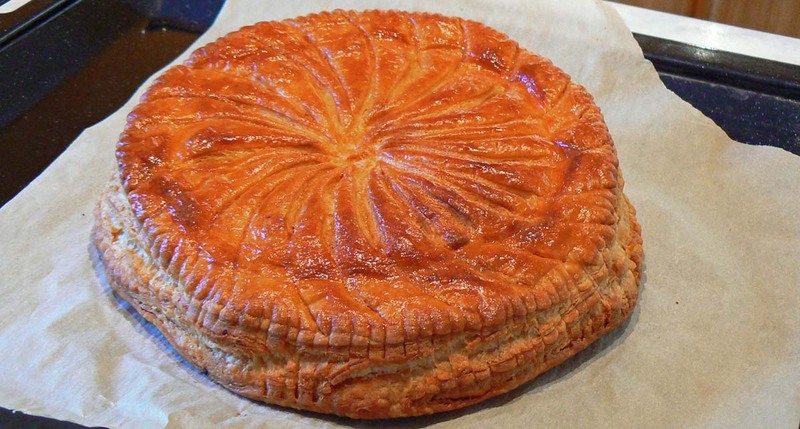 This is the season of the galette des rois. It's the kings' cake, named for the three kings of the epiphany. In France, on the epiphany, it's traditional to eat a cake made from pâte feuilletée (flaky or puff pastry) and filled with frangipane (almond paste). Hidden inside the cake is a little prize, and the one who gets the prize in his slice is king for the day. Getting ready to make the détrempe. Since I've lived in France, I've noticed how expensive these little kings' cakes can be. At one point I decided that I could make one and not have to pay the price for the bakery version. And I have succeeded to such a point that I don't even think of buying one in a bakery any more. The flattened butter goes on the rolled out dough. Flaky pastry is not at all difficult. It just takes a little time. First, you start off with a détrempe. That's a fancy French name for a mixture of flour, salt, and water. My recipe calls for 250g flour, 120ml water, and a half a teaspoon of salt. 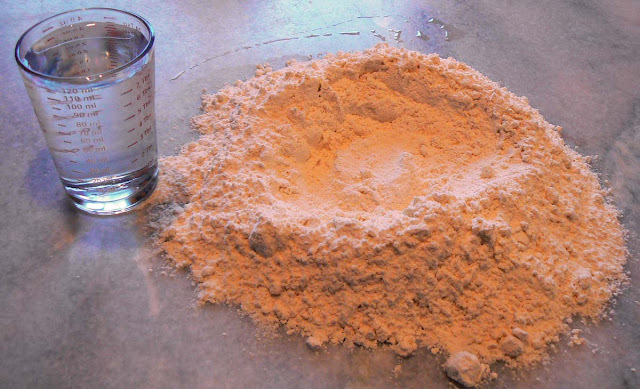 Mix that up until you get a dough, then roll it out to about an eighth of an inch thick. 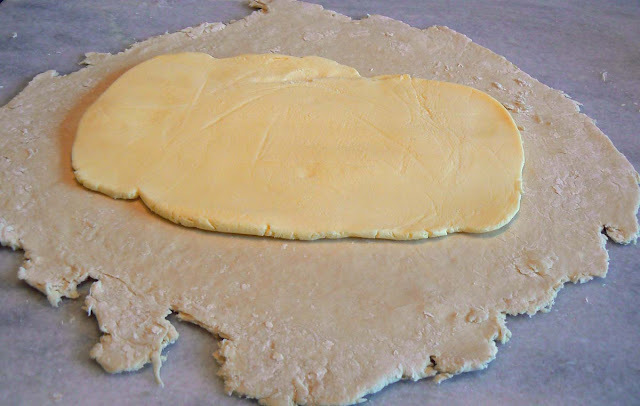 The dough is folded over the butter to make a rectangular "envelope." At that point you layer some butter on top. Before the dough is made, take 250g of cold unsalted butter (about 2 sticks in the US) and flatten it between two sheets of plastic wrap, roughly in the shape of a rectangle. Stick that in the fridge until the détrempe is ready. Roll the détrempe out so that it's larger than the flattened butter. At that point, put the butter on top of the dough, then wrap the dough around it, being sure it forms a perfect rectangle. The dough is folded onto itself twice. 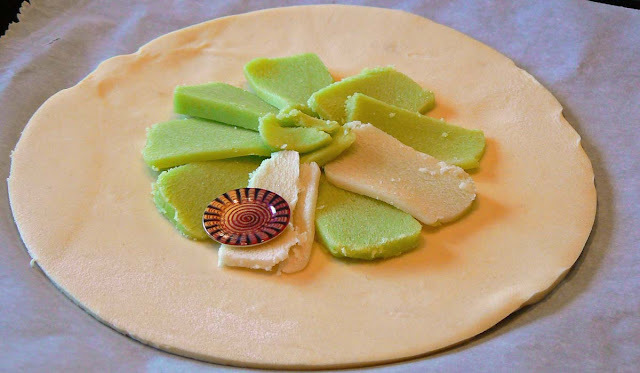 Make two "dimples" in the dough to remind yourself. Roll it out again, then fold it on itself in thirds. Roll it out once again, maintaining the rectangular shape, then fold it again. At this point you've done what's called two "turns." Wrap the dough in plastic and stick it in the fridge for an hour to rest. The first step of a double turn. The next step is to fold the dough on itself once more. 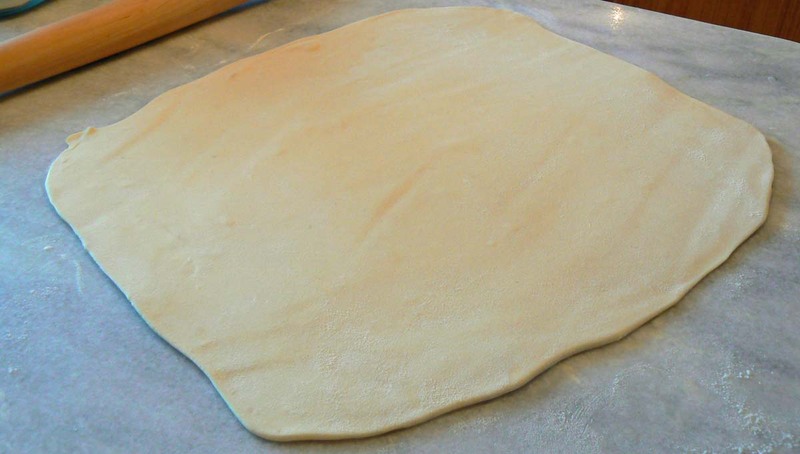 After the hour of rest, take the dough out, roll it again, then fold it in what's called a double turn. That is, fold one end of the rectangle into the middle, do the same on the other end, then fold the whole thing onto itself. Wrap it again and put it back into the fridge for another hour. Repeat this several times. 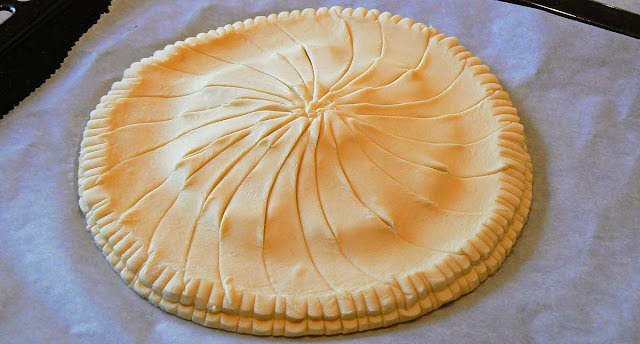 Every time you do, you are making thinner and thinner layers of butter and flour, and that will make your puff pastry. In my next post, if I'm lucky, I'll show you how to make the kings' cake itself. You've heard of The Umbrellas of Cherbourg? Well, these are the umbrellas of the Cher. 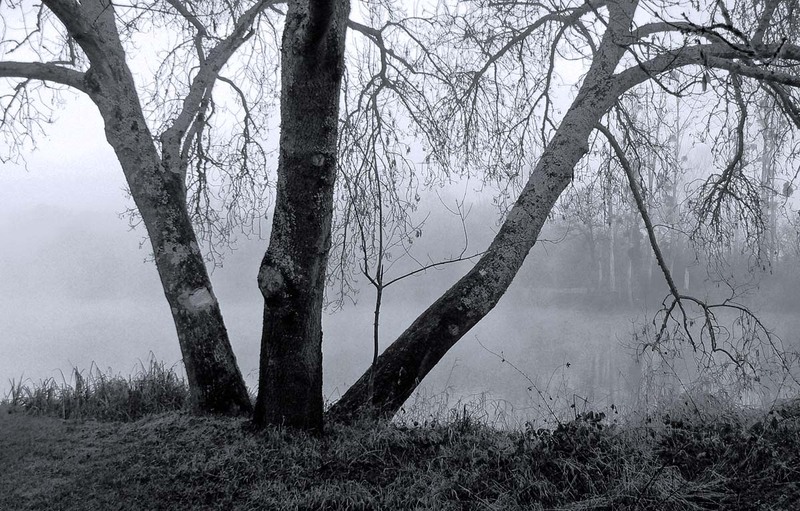 I took this picture at Chenonceau in the winter of 2006. Apparently, we visited the castle in the rain. And that turned out to be a good thing because, contrary to what this photo implies, there was hardly anybody there. Strolling along the left bank of the Cher at Chenonceau, March 2006. Click to bumbershootenate. You might see this scene if you went to the castle right now. It's been raining an awful lot. Pretty typical winter weather for us. In fact, snow is not all that common here, even though the past few years have had at least one good snowfall. But this winter season is not over yet; it still could happen. I remember, back in 2006, being in the gallery that crosses the river and I was the only person there. That's unusual for us tourist types. You can see my picture from that day here. And yes, in case you're wondering, this was originally a color photo, and not a very good one. I've messed around with it in Photoshop to give it an old-timey look. I like it better this way. I've noticed a lot of the flowering trees and shrubs in the back garden have set their buds. It's making me look forward to spring, even though winter's just started. And it hasn't even been very cold yet. Still, a couple of hours of sunshine and a look at the buds does wonders. 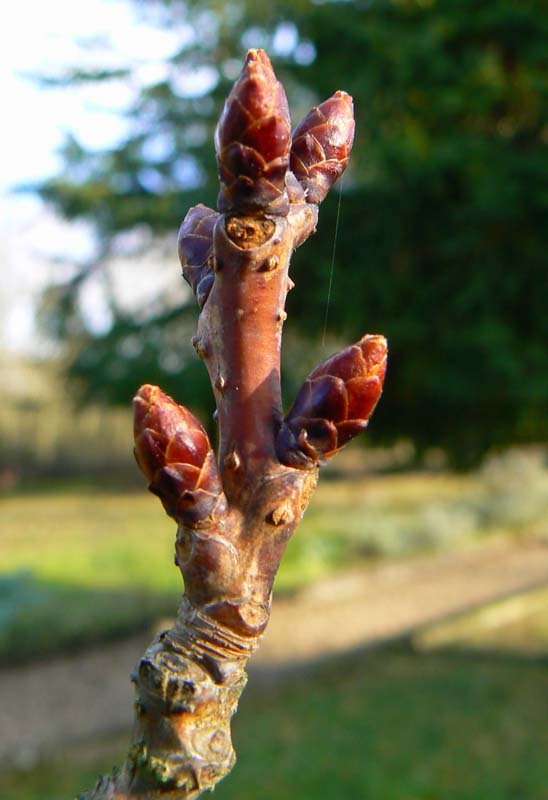 A few buds on the flowering prunus tree. It doesn't bear fruit. I've also been thinking about what to plant in the vegetable garden this year. I'll certainly do the standard tomatoes, eggplant, and green peppers. I'm also planning a larger winter squash crop and I want to have green beans (which I haven't planted in a few years). I'll probably have some leeks and some chard. There will likely be collard greens and some cucumbers. Turnips are a possibility, too. One thing we discussed is not putting corn in this time. That'll make room for some of the other stuff. Here's a shot from about five years ago. This was before I had my first digital camera; I was using Ken's off and on at the time. This blog was only a few months old then and I don't think I ever posted this picture, although I'm sure I've posted others like it. Looking at the castle from an island in the Loire. It's the castle at Amboise on the Loire River, about 32 kilometers (20 miles or so) from where we live. We used to go up to Amboise a lot more frequently than we do now. That said, we did go at least once in 2011, and we even visited the castle. I'm looking for old photos to post because our weather is not very conducive to photography right now. But that won't last. It never does. Back in 1990 (if memory serves), Ken and I went to Yosemite National Park, not for the first time, but it was the first time we spent the night in the park, I think. We went with our friends Cheryl and her husband John, and our friend Sue (Cheryl's cousin) and her kids. We rented three cabins at Yosemite Lodge and planned to spend an early spring weekend (it was March) in the park. 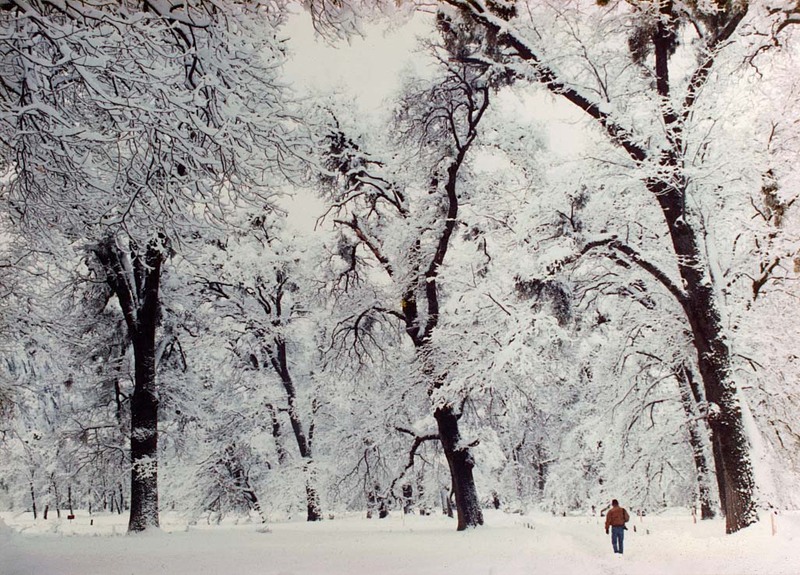 This is me walking through the virgin snow in Yosemite, camera in hand. It was great getting there, getting settled into our cabins, and partying with food and wine the first night. We all got a little tipsy and retired for the night. We woke up the next morning to the most amazing surprise: well over two feet of snow! Sue and I immediately grabbed our cameras and went out to take pictures before the plows and people could make marks in the snow. It was incredible. Sue took this photo of me as we wandered around the valley floor that morning. I think it's very cool, and have had it in a frame in the house since then. I don't remember if this path had been cleared or whether there wasn't that much snow under the trees, but I'm obviously not knee-deep in snow in the picture. I remember that second night (I think) was the night of the Academy Awards broadcast. Cheryl was really looking forward to seeing it. The restaurant at the cabin village had advertised that they were going to show it on their big-screen t.v. But during the storm, the satellite dish had filled with snow and couldn't receive a signal. No Academy Awards. Still, we had fun wandering around the park in the snow, seeing it like most of us had never seen it and are unlikely to see it again. Since then, those particular cabins have been torn down. I think there's a new lodge/hotel at that site now. I haven't done a Kitchen Collection post in years. But this weekend we got a new food processor and I thought, why not? Our old processor was made by Braun; we bought it at Macy*s in San Francisco way back in 1988 or so. I was one of those people who used to say, "I don't need a food processor. That's what knives are for." Silly me. One day I wanted to make something that called for a lot of very fine chopping (a vegetable terrine or something similar) and we broke down and bought the Braun. 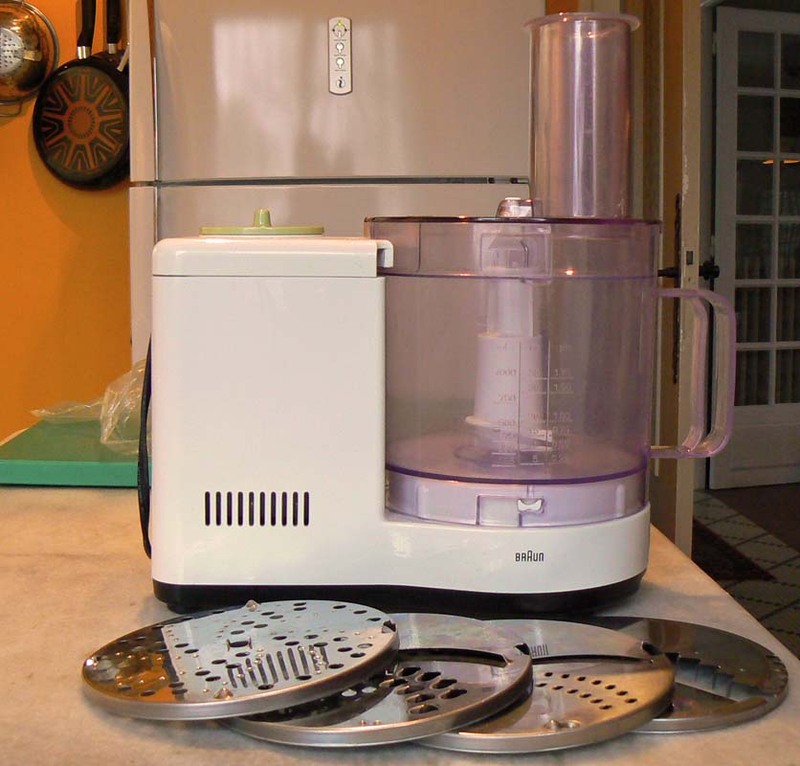 The old Braun food processor from 1988 with its four slicing and grating blades. It was a great machine. At one point we got a new bowl for it as the original bowl was getting a bit scratched up. I use it all the time these days. I make pie crust in it. I use the attachments to grate carrots, celeriac, potatoes, and sometimes cheese. We also use it to chop basil for making pesto sauce. But I noticed recently that the central spindle is beginning to crack. That's not good. And just the other day I was grating some cheese and the part that holds the grating disks on the spindle shattered into several pieces when I turned the machine on. I decided it was time to look for a replacement. The new Moulinex Master Chef. Ooooh, shiny! This is where the internet comes in very handy. Ken and I did some online shopping and comparisons. 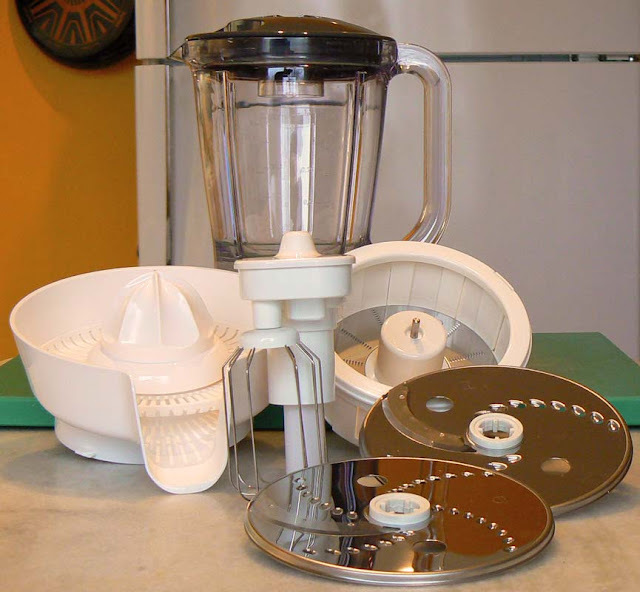 I found out that Braun has moved out of large food processors and is favoring the smaller variety that are powered by stick blenders. In France, SEB makes a lot of different style of machines, each with different features and different power levels. We were tempted by several of those. I even looked at Cuisinart. I might be able to afford one if I mortgaged the house. Too big, too fancy, and not for me. Clockwise from left: citrus juicer, blender bowl, centrifuge juicer, grating/slicing blades, whisk. But then we saw this Moulinex (an old French company now owned by SEB, which also owns Krups, Tefal, and All-Clad, among other brands). The 3-liter bowl is a liter larger than the Braun bowl. 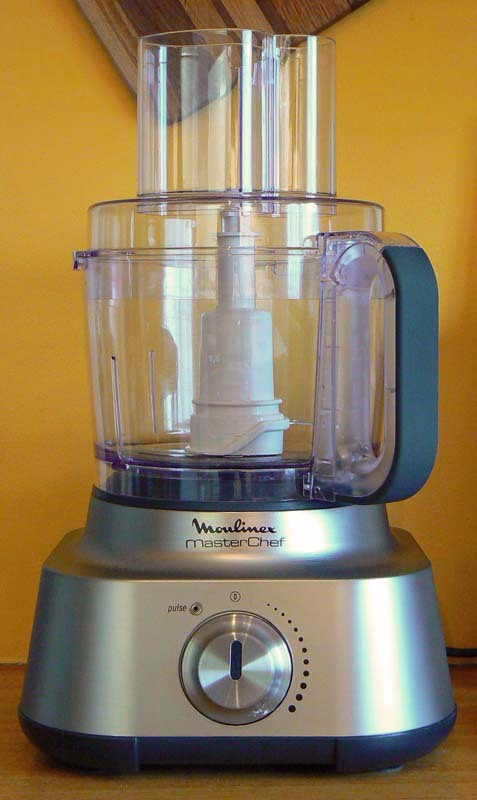 It has two reversible grating and slicing disks, a wire whip attachment, a kneading blade, includes a citrus juicer and a centrifuge juicer (I'm not sure how we'll use that yet), and a 1.5-liter blender bowl attachment. At 1,000 watts, it's more powerful than the 750 watt Braun. 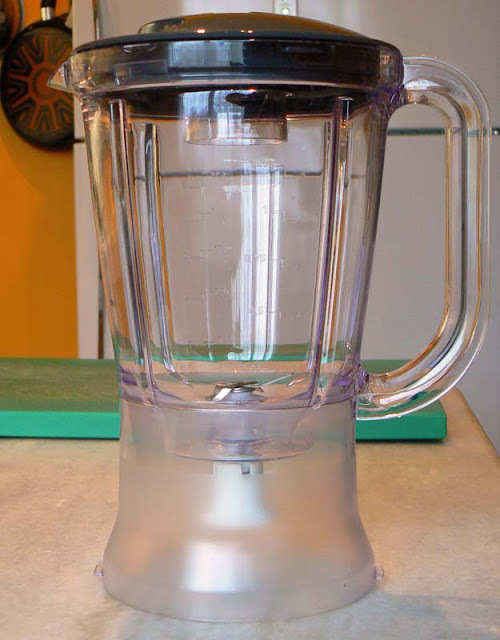 A close-up of the blender bowl. This will be good for making crêpe batters. The Moulinex was featured on several online shopping sites, but Amazon had a deal that was significantly lower in price than most of the others. The only drawback was that they said it would take four to six weeks before they could ship it. So what, we said. It's worth the wait for that price, and the Braun still works without the grating attachments. So we placed the order. The very next day we got a message from Amazon saying the processor was shipping and that we'd get it on Friday. And we did! The machine is larger than what we're used to, and I'm a bit tentative with it for the moment (the blade is so sharp that I actually cut my finger handling it), but I have a feeling it won't take us long to get used to it. I should also mention that the old Braun, being an American model, needed to be plugged into a transformer to get its power. We have a transformer about the size of a small toaster sitting behind the microwave. When we first got it eight years ago, it powered three American appliances. Now it only powers one: the Kitchen Aid stand mixer. I realized too late that I didn't take a picture of the dough kneading attachment. Oh well.